Discerning the future of SEO is a bit like trying to explore the night sky. It’s vast, deep, exciting and complex. Any explanation involves multiple moving concepts like SERPs, backlinking, internal linking, on and off page optimization, site structure, featured snippets and voice search. That’s probably why there are entire websites dedicated to SEO, its dynamic present and murky future. I thought about asking my Magic 8 Ball a series of questions and relaying its answers to you, but then an ordinary conversation between my kids and I came to mind as the perfect way to address the topic of SEO and what the immediate future of SEO might look like. 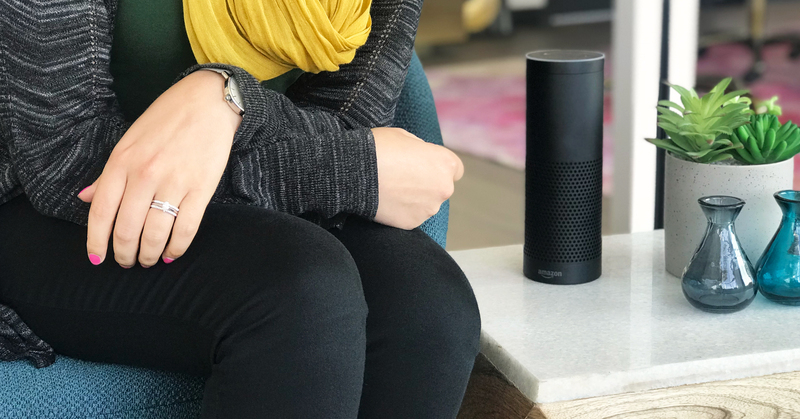 She responded, “Sorry, I’m not sure” to our query and, after internally regretting choosing an Echo over a Google Home, I picked up my phone, said, “Okay Google,” and asked my phone the same question. 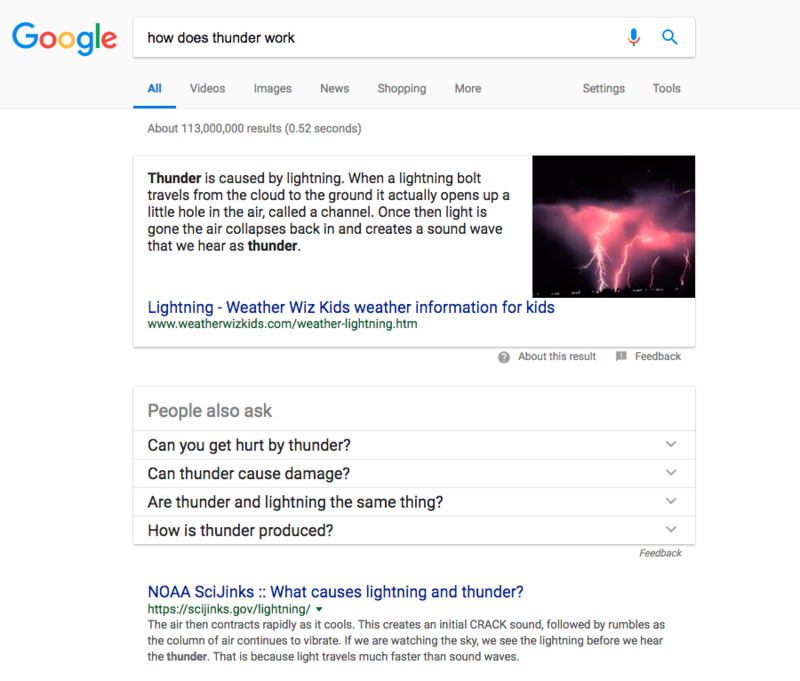 It instantly returned an audio explanation about lightning, little air holes and sound waves, and showed us in a featured snippet where to go to find more information. This scenario shows how technology is once again transforming how we access and interpret information, which is really at the heart of SEO. Search engines are somewhat like virtual librarians; we ask a question or indicate what we’re looking for and Google, Bing and others provide us with answers. Thus far, search queries and search results have largely been text-based; we type in our search term with a computer or smartphone keyboard and the search engine we’re using returns a list of results. Those results are usually hyperlinked with a brief bit of copy previewing the text that the search engine found. However, as technology has made the creation and sharing of images, audio and video ubiquitous, we are communicating with each other and the world in new ways. Instead of just using words online, people frequently seek video. For search engines to remain relevant, they have to return results in video and audio form. Today, featured snippets and related inquiries are part of the transition that we’re seeing away from text and typing toward a ‘call and response’ kind of experience. There is only one ‘traditional’ search result above the fold. A featured snippet appears at the top, followed by related questions. This reality has marketers and SEO professionals alike scrambling to win the featured snippet spot for all the keyword terms and phrases for which they’re trying to compete. Exactly how to earn featured snippets is beyond the scope of this article, but SEMrush recently conducted a large-scale study revealing a data-based approach to competing for Google featured snippets on mobile. Suffice it to say that the present state of SEO involves featured snippets and mixed media search results, but the future of search and of SEO could very well not involve typing at all. As marketers, we have to start thinking beyond traditional SEO tactics if we want the brands and businesses we manage to be found online. An additional trend is the role of AI in search. As in all things, artificial intelligence is impacting how we find information online. Contrary to what some might think, humans aren’t processing the search results we see. Google’s machine-learning AI system, RankBrain, processes the search results it returns to our queries. Google has actually built an AI, Google Brain, that is better at building AI than a human. What does AI building AI that process search results mean for marketers? Probably a lot, but at a minimum, I think it means Google cares a lot more about providing relevant results than we do. Instead of trying to crack the SEO code, we need to focus our energy and creativity on creating easy to understand, satisfying content that speaks to the interests, concerns and needs of our ideal audiences and answers common questions they ask. Search Engine Land suggested earlier this year that linkless mentions of brands could start to carry more weight. This is good news for marketers who work hard to create conversations about their brands online. Even if you don’t get a link back to your website, the mention of your brand on a variety of sites and social media platforms could help you show up in search. Google has been indicating for a while now that it will rank mobile versions of content above desktop versions for both mobile and desktop users. With more people accessing the Internet on their smartphones instead of desktops it means, at a minimum, that marketers need to make sure the brands they manage have mobile-friendly websites and content developed with mobile devices in mind. This trend is great news for marketers, who have long been concerned about delivering satisfying experiences to their audiences online. With search results becoming increasingly customized, it follows that UX is going to start playing a larger role in search than it has in the past. For marketers, this means that you should keep doing what you have been – analyze your website and get to know your users (and what they want) inside and out. Don’t let either of those statistics be true of you. In a final future of SEO trend that we’ll cover today, one SEO analyst named Rachel Stephens, predicts that paid search spots won’t just go to the highest bidder, but to the highest bidder with the best content and fit with the intent behind the searcher’s query. Trying to digest data and predictions about the future of SEO can easily leave one feeling overwhelmed to the point of paralysis. The worst thing you could do right now is nothing. The best thing you could do is to get back to the basics of inbound marketing. If all or any of that feels like more than you can handle, call us. 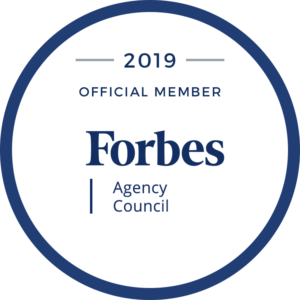 A storm may be on the horizon, but our talented team of storytellers, strategists and digital pros can help you weather the present and future of SEO as well as all your marketing challenges and opportunities successfully. Running a PPC campaign? Let our team audit your account. We’ll provide recommendations to optimize your performance and increase your ROI!